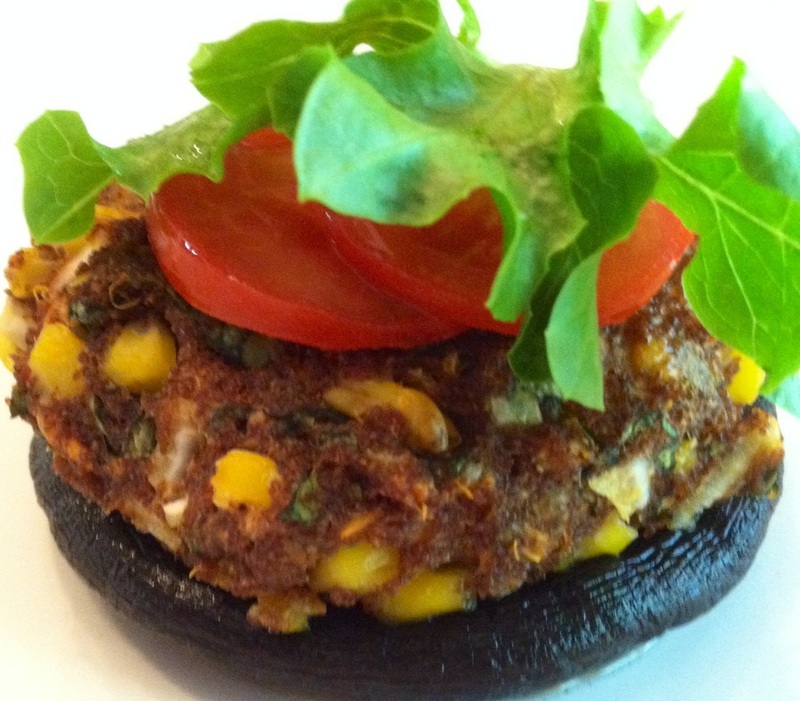 If you are looking to fight disease this vegetarian burger served on a mushroom cap is one meal you will want in your culinary forces. For many of the whole grain dishes substitutions can be made. However, this is one of the few exceptions. Teff's ability to form a cohesive network allows for the burger to hold its shape independently of a binder. No other whole grain possesses this property to this extent. Teff is high in protein, iron and calcium and provides a blank canvas for many flavors. This dish lends an opportunity to incorporate nutrient dense greens in the form of kale or spinach. Basil can also make an appearance and add a unique anise flavor as well as its own nutrient profile. Herb's flavors are much stronger then typical leafy greens and should not be added heavy handedly. Use your favorite seasoning blend to add flavor that appeals to your palate. McCormick's Perfect Pinch seasoning blends are the easiest to find at the grocery store but are manufactured by a huge company and sometimes have questionable ingredients. I do encourage you to buy organic and nontraditional brands when you have the opportunity. Sweet potatoes add bulk but also supply beta-carotene, a phytochemical that acts as a free radical destroyer. Beta-carotene can also be converted into vitamin A in the body and plays a role in cellular growth and replication. By using a portabella mushroom cap as a bottom bun this meal remains very low in calories and without nutrient deficient and refined carbohydrates. Mushrooms are one of the most nutrient rich foods available and by replacing the bun significantly increases this meal's disease fighting power. The cooking process for this dish can be a bit laboring. Cook in large batches and save the leftovers in the refrigerator to eat throughout the week. You could also make meatball shapes and serve with pasta alternatives or just pack in a baggie and eat as a snack. Directions: In the sauce pan cook the teff according to the packages instructions. Be careful not to burn the delicate teff during the cooking process. Wash and place the sweet potato in a square oven mitt and then heat in the microwave for 5 minutes. Preheat the oven to 400 degrees. While the oven is preheating put the garlic, with the skin still on, on a cooking sheet and into the oven. Heat the oil in the sauté pan and finely chop the onion. Once the oil is heated add the onion and sauté until softened. When the sweet potato is finished cooking carefully remove the skin. You may want to let it cool for a few minutes before attempting this. After the teff has cooked add it to a mixing bowl along with the sweet potato, greens, corn, onions and seasoning blend. Remove the garlic from the oven and carefully remove the skin. Smash the soft garlic with a knife and add it to the mixing bowl. Begin mixing the ingredients with a potato masher. Once the ingredients have cooled use your hands to finish the blending. Once evenly mixed start forming 4 burger shaped loafs and placing on a tin foil lined baking sheet that has been sprayed with cooking oil. Allow to rest for 15 minutes before baking in the oven for another 15 minutes. Grill or sauté the mushroom caps to server as a bun. Top the burger with your favorite toppings.